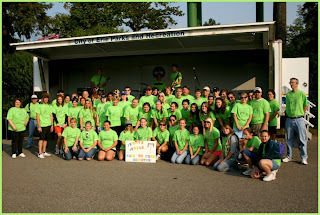 On Sunday September 21, 2008 we participated in the JDRF Walk to Cure Diabetes. This is maybe our 8th year, and this time Jenny organized kids from the Harbor Creek Band and from the HCHS Junior Class and the entire school. Given no homecoming nor competitions the day prior, we had a great turnout. Here are at least 60 walkers for Jenny’s Jewels team. A good time was had by all. Two HCHS bands played and we supported the cause very well. Many thanks to all who participated and supported the walkers. I’ll update the Blog once I know the total donations from our team. This entry was posted in Diabetes, Fall, Walk JDRF by admin. Bookmark the permalink.